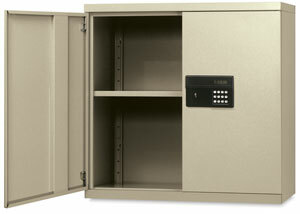 Easy assembly, keyless entry, and secure storage are yours with Sandusky Lee's Keyless Electronic Wall Cabinet. The cabinet's bolt-free design snaps together easily without the use of tools. A keyless electronic coded locking system accommodates two passwords (one for an administrator and one for an additional user) and keeps a record of the day, date, and time the cabinet is accessed. An exterior battery pack that can be plugged into the keypad and an emergency backup key are also included. Ideal for classroom settings, the Keyless Electronic Wall Cabinet features a powder coated finish and measures 12"W × 30"D × 30"H (31 cm × 76 cm × 76 cm), a useful size for storing art supplies up and out of the way. It features a shelf that can be adjusted up or down in 2" (5.1 cm) increments.